Stewart Island/Rakiura is New Zealand’s third-largest island and southern-most settlement. With sheltered inlets, forested hills, rugged coasts, dunes, swamps, scattered islets and bizarre granite outcrops, it is remarkable for its variety of landscapes. It has a long history of Māori habitation, and sealers and whalers also lived there from around 1800. In the 2010s it had a small permanent population, but was visited by around 30,000 tourists each year. 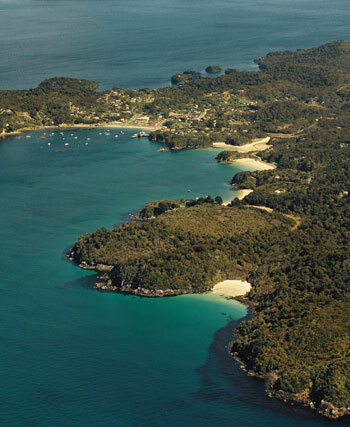 Stewart Island/Rakiura is New Zealand’s third largest island. It is located just south of the South Island. Apart from settlements around Halfmoon Bay, few people live there. Rakiura, the island’s Māori name, means ‘glowing skies’, a reference to the southern lights, aurora australis, which can sometimes be seen from the island. The English name, Stewart Island, is in honour of William Stewart, first mate on the sealer Pegasus, who charted Port Pegasus in 1809. Most of Stewart Island/Rakiura is much as it was before human settlement, with forests inland and scrub around the coasts. About 85% of the island is part of the Rakiura National Park, which was created in 2002. Birds thrive on the island because there are few introduced predators. There are around 15,000 southern tokoeka, or Stewart Island kiwi. There are several species of native parrot on Stewart Island and surrounding islands, including kākāpō. Three species of penguin breed along the coast. Fur seals and sea lions both breed on Stewart Island and surrounding islands. Many species of fish live in the island’s rivers and in the surrounding sea. Polynesians had reached Stewart Island/Rakiura by the late 1200s, but did not settle permanently. Māori settled around the coast and on some neighbouring islands. They caught fish and harvested tītī (muttonbirds). According to tradition, the first Māori were of the Waitaha tribe, and later Ngāti Mamoe and Ngāi Tahu people arrived. English explorer James Cook sighted the island in 1770. From around 1800 to the 1820s European sealers caught seals, and whalers worked there from the 1820s to 1840s. Many married local Māori women and mixed-descent communities grew up. In 1863 Stewart Island became part of the province of Southland. In 1864 the government bought most of the island from Ngāi Tahu. The main industries on the island were sheep farming, logging the native forest, and fishing. In the 2010s fishing continues, and hunting is also popular. Many tourists visit the island, many of them trampers. Stewart Island is part of the Southern District Health Board. Oban is the major township of the island. There is a regular ferry service between Bluff and Oban, and there is an airport close by. Oban has a library and community centre, primary school, museum, hotel and a number of eateries. The only roads on the island stretch from the town. Tramping tracks include the Rakiura Track, the North-West Circuit and the Southern Circuit. Some tracks are often muddy and rugged. Codfish Island (Whenuahou) is an island off Stewart Island. Kākāpō have been relocated there to protect them from predators. Ulva Island, the largest island in Paterson Inlet/Whaka ā Te Wera – a large inlet south of Oban – has been a scenic reserve since 1892. Ruapuke Island, north-east of Stewart Island, thrived in the early 1800s as a centre for Ngāi Tahu leader Tūhawaki. Johann Wohlers ran a Lutheran mission station there from 1844 to 1885. No one lives there in the 2000s. The Tītī/Muttonbird Islands are where Rakiura (Stewart Island) Māori gather tītī (muttonbirds) for two months every autumn. There is evidence of early Māori settlers at The Neck and Port Adventure. South of there the coast is exposed and rocky. There are hunting blocks near Lords River/Tūtaekāwetoweto, and some land and forest owned by Māori. Port Pegasus/Pikihatiti is a sheltered harbour on the south-east coast. Nearby are natural granite domes, which give the area an otherworldly feel.